The Grand Valley is often overlooked as a destination, especially when compared to the surrounding ski towns and larger cities. But locals will tell you that we have some of the BEST entertainment you could ask for in Colorado. If you are planning to visit, you are going to want to put these 5 things on your to-do list! 1. Hiking/Biking: There is no shortage of mind-blowing trails all within, or very close to, Mesa County. From desert to mountain to waterfront you have your choice of terrain to tread. Enjoy a quick stroll/ride through the easy-to-navigate Lunch Loop or Kokopelli trails, or pack in your camping gear for an overnighter in Escalante Canyon. Explore the Colorado National Monument by way of Serpents Trail and take in the most breathtaking views you will ever lay eyes on. The Grand Mesa provides year round activity, with trails clearly and safely marked for snow shoeing and other winter activities. If you like a little more urban feel, walk or ride as much of the Riverfront Trail as you wish! 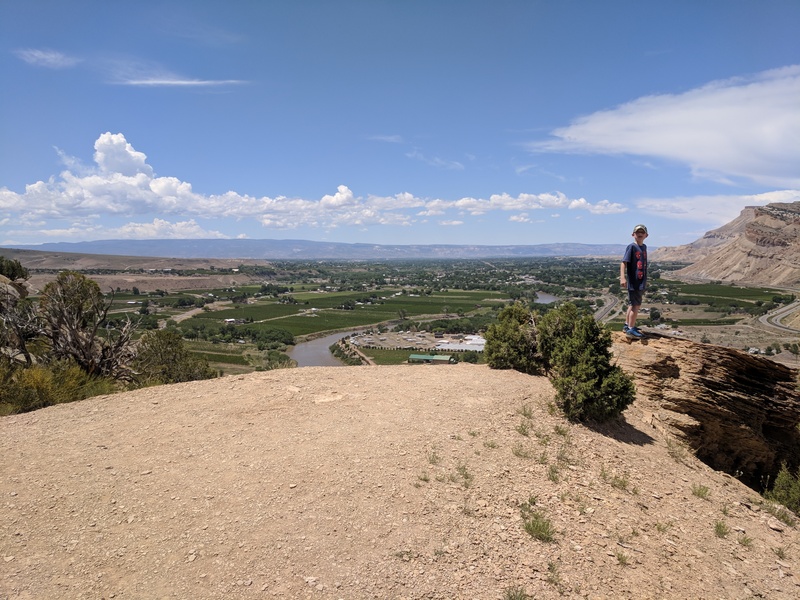 It spans from Palisade all the way to Fruita, following the path of the Colorado River, with access to shops and restaurants along the way. There is literally something for everyone! 2. Rafting: The Mighty Colorado River beckons you to splash, float and brave it's waters! Explore the untamed west and soak up the beautiful scenery you don't get access to from the shore. Much like the hiking, there are rafting adventures suitable for nearly every age and experience level. You can choose from River Expeditions that are hosted by pro's, or bring (or rent!) your own gear and show off your skills. Leisurely floats and wicked rapids, it's all your choice and bravado. 3. Wine Tasting: Palisade is what we consider to be our Napa Valley of the Rockies. This sleepy little town nestled between the base of the Grand Mesa and the Bookcliffs really is unassuming in nature. The Fruit and Wine Byway is a twisting tour through some of the best wine in Colorado, and arguably the world. Palisade and Grand Junction Wineries continue to win awards year after year, and yet, stay humble. The never crowded tours offer a unique and elegant tasting experience. If you like a little more bustle, come for the Colorado Mountain Winefest (voted #1 Wine Festival in the USA!) hosted annually September. Wine isn't the only charmer in Palisade, which is also known for it's peaches, orchards and other produce, and if you are into the spirits you can visit the Peach Tree Distillery to try some of the best gin and vodka around. 4. Downtown Grand Junction: So maybe we are bragging just a bit when we say our downtown is the best. It may not be the biggest, but those few blocks pack in more charm and happiness than you can imagine; quaint shops, trendy boutiques, world-class restaurants and cuisine, and a healthy nightlife. Not to mention, the entire downtown is a built in art-crawl! One of a kind sculptures line the streets, while every other doorway leads to another art studio. 3 Venues are host to some incredible talent from across the world, including bands, musicians, comedians and more. And, because it is so centrally located? You are minutes from hundreds of other awesome activities. 5. Farmers Markets and Festivals: It's no surprise that with such a rich agricultral background we are home to some of the best. From the beautiful annual Lavender Festival in Palisade to the plucky Mike the Headless Chicken Festival in Fruita, we have a wide array of evens to celebrate the elegant, the bizarre, and everything in-between. The little town of Mack is home to the now world-famous Country Jam, a 4 day long music festival that rivals Woodstock. In June, the local farmers markets fire up and bring on a rich bounty we celebrate every year. We have a market in every corner of town, and each bring it's own unique flair. Seasonal fruits and vegetables take center stage, but there are more than enough vendors to satisfy your shopping bug. Food trucks and local restaurants offer an incredible variety of flavors and tastes with a focus on farm to table.